Mummy Of 3 Diaries: Eeek My Little Man Has Got A New Bed! My little man is growing up so fast, where does the time go? He's three now and up until last week he was still happily sleeping in his cot but it was time for the big change. I had been putting it off so long, I guess I was just scared about how he would react. Bedtimes in our house are really good and I didn't want to upset the routine but after a week of Ryan being in his new big boy bed, I really don't know what I was so worried about. He's been perfectly fine. 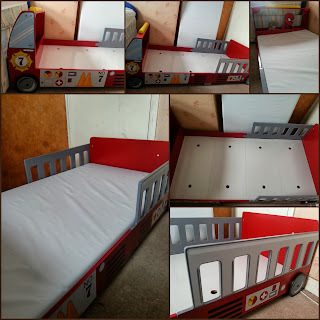 We decided to get him a toddler bed so that it would be low to the ground incase he fell out but we also decided to make things a little more fun and went for a totally cute Fire Truck bed. It's amazing, it has a little storage compartment at the end and ladder cut out sides that double as bed rails to keep in place. It's all made of beautifully painted wood and is reasonably easy to put together. 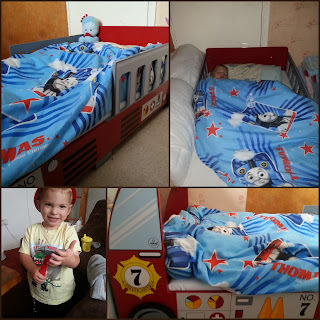 It's made Ryan's transition from a cot to a regular bed so easy, from the very first time he saw it he was so happy. I'm so proud of my big boy, from night one he didn't get out of his bed once. He loves it so much, a little too much as he doesn't want to get out of it in the mornings which can be a bit of a battle but so worth it. Ryan's new Fire Truck Bed Frame came from a wonderful site called Wayfair.Co.Uk whose mission is: To make Wayfair your favourite place online to buy anything for your home. Wayfair believes that options for your home can come from just about anywhere, so they carry over 11,000 brands of product in categories like furniture, lighting, etc. They also know that home furnishings often don’t fit in your car, so they offer free shipping on most big stuff and most other stuff too which is really good for people like me who don't drive at all. Right now the Fire Truck bed frame costs £184.44 but it's normal RRP is around £238.44, that's a great £70.04 saving. It doesn't come with a mattress but most cot bed sized mattresses will fit, I bought a simple foam one from my local bed store which fits perfectly in size and thickness. My little man Ryan loves his new bed, it's such a fun bed frame that even I want to get in it and have a go. In the daytime he often goes up and plays on it with his toys giving them a ride around in the front of the truck (the storage compartment). The pictures on the side are all painted on, they're not stickers so they won't peel off in a hurry which I'm happy about. At bed time, Ryan loves getting into bed, we've had no moaning at all since it arrived. Every time we get a visitor like Granny or a family friend he can't wait to show them his new bed, he adores it. Ryan has been in his new bed for over a week now and we've not had any problems at all. His new bed looks fantastic and fits nicely into the space where his old cot once stood. It's the perfect little bed for the perfect little boy. 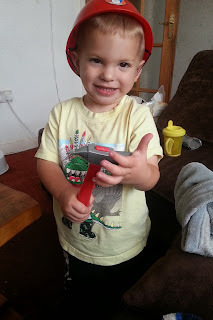 Since getting his new Fire Truck bed he's gone a little Fireman crazy, I've had to buy him a little Fireman helmet to keep him happy. It's Fireman Sam on the TV and Fireman Ryan in my house, I'm so pleased that his new bed went down so well with him. I had no reason to be scared after all, infact it was best decision I ever made. The amazing people at Wayfair sent Ryan his new bed for free for the purpose of this post but that does not influence my thoughts or opinions in any way. My review is 100% honest. Wow! That is a fab bed!